Fancy a peek inside our September Into the Wild box? Thank you to @joareads for this for this gorgeous unboxing photo. 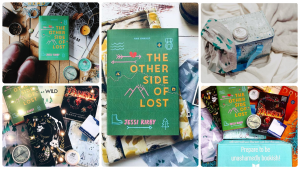 The Other Side of Lost by Jessi Kirby: Take some time out from technology and get ready for an adventure! Our September read follows a social-media starlet who swaps her perfectly preened existence for an epic solo hike into the wild. Mari’s journey is an emotional rollercoaster of self-discovery, beautiful scenery, unique outdoorsy experiences and backbreaking challenges and will probably leave you with a serious case of wanderlust! Clubhouse Invite: Join us around the Book Box Club Campfire (aka our online Clubhouse!) to discuss dream travel plans, wilderness adventures and our inspiring featured read, with the book’s brilliant author, Jessi Kirby. Suggested book group snack = toasted marshmallows. Bonus Book: It’s our birthday, so we’re treating you to a second amazing adventure story. Our Bonus Book is a highly anticipated fantasy novel, not due for UK publication until November. Damsel stars a handsome prince, a distressed princess and a fierce dragon… Happy reading lovely members. 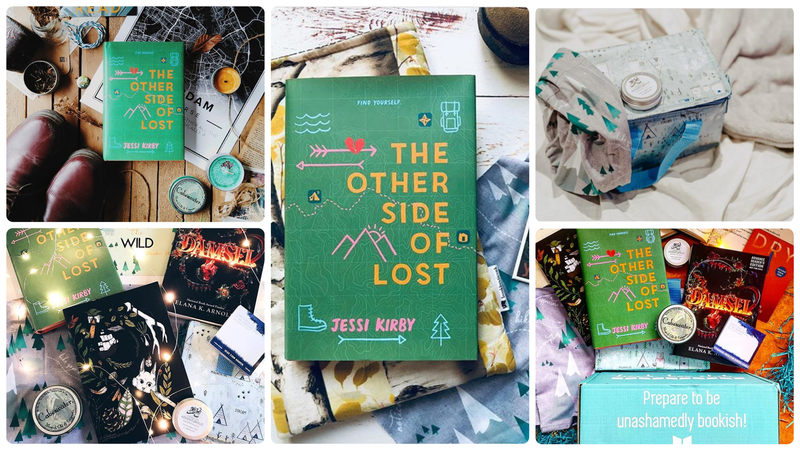 Into the Wild scarf by Book Box Club: Equip yourself for an adventure with our Into the Wild scarf/headband, complete with inspirational quotes from The Other Side of Lost and ginormous friendly bears! Reader’s pin: Decorate your backpack and declare your status as a bookish explorer! Thanks for treading the wild, unchartered paths of YA fiction with Book Box Club over the last two years. Bookish goodies: Check out these awesome new YA titles coming soon from our buddies at Walker Books and Penguin Random House. Thank you to @shonashoe, @anarchy_in_the_library, @joareads, @becki_reads, @thebooknerd90 and @wishiwasabook for these awesome photos! 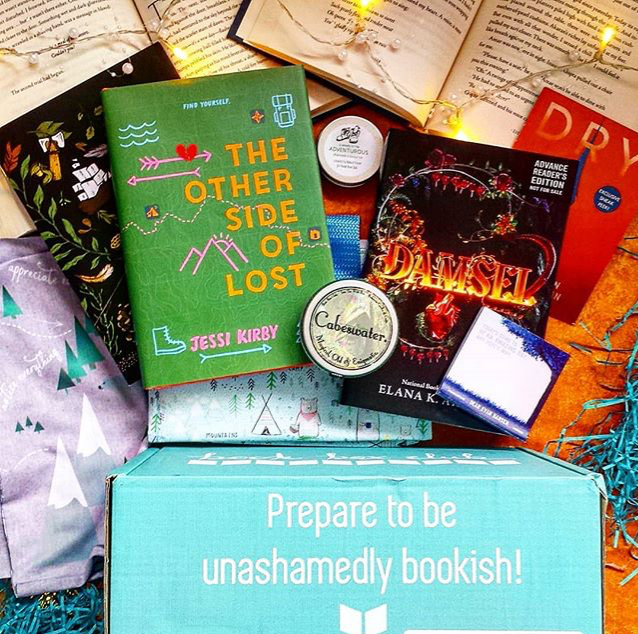 Our September box marked the second anniversary of Book Box Club and above all we’re so thrilled that we got to celebrate by including such an incredible book. We both LOVED The Other Side of Lost: it was moving, inspiring and by the time we truned those final pages we were each despearate to plan big adventures of our own. We also had a blast sourcing lots of awesome items, honouring some of our favourite wild places in fiction (Cabeswater and Neverland) and equipping our members for bookish adventures. As ever, we were assisted in our mission to fill your boxes with gorgeous goodies by a whole host of amazing artists, designers, crafters. A huge thanks to all of the talented people that helped bring our Into the Wild box to life. Finally, we’d like to say a big thank you to our lovely members for your comments, your enthusiasm, and for sharing your photos, blogs, vlogs and feedback with us. It felt particularly special to celebrate our two year anniversary with so many creative, inspiring and friendly members in our club. Your support really does mean the world to us. THE THEME: Our theme for November is SMUGGLERS AND THIEVES! To get you in the mood for our swashbuckling theme check out our atmospheric film trailer. At the helm of our November read is a resilient young woman intent on journeying to America for a life-saving operation, but first she must stowaway on a ship, kidnap the Captain’s daughter, smuggle her prisoner back to Cornwall and exchange her for that all-important ticket to fix her faulty heart. Readers be warned, this isn’t your average swashbuckling voyage: sure, there’s drama aplenty, but there’s also a surprising amount of tenderness in this brilliant book and the writing is on another level of beauty (think Sarah Crossan or Patrick Ness meets Treasure Island or Peter Pan!). This gorgeous new release YA hardback is one of the prettiest books we’ve ever set eyes on and will be accompanied by a signed bookplate from the author. We can’t wait to share it with you all! THE GOODIES: We are thrilled to announce that ALL OF THE ITEMS IN OUR NOVEMBER BOX WILL BE EXCLUSIVE meaning that you’ll need to be subscribed to get your hands on any of this gorgeous loot! 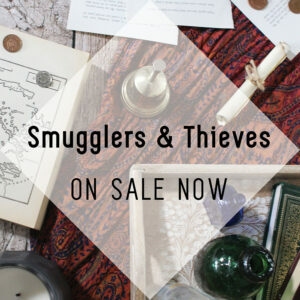 As well as a beautiful fabric item designed exclusively for our members by UK homeware studio Sparrow and Wolf AND a perfectly-practical item illustrated by bookish artist Keeper of the Sun, our November box will be crammed with goodies inspired by some of fiction’s most memorable smugglers and thieves! If you’re a fan of Six of Crows and Peter Pan you will not be disappointed. THE AUTHOR BOOK GROUP: Of course, no Book Box Club box would be complete without a personalised invitation to our members-only online book group. Our November read will see The Clubhouse turn captain’s table as we gather around in our online chatroom with our unashamedly bookish shipmates/members to chat about our featured read. Our guest of honour will be the author of our November book, who is very excited to talk to you all and to answer your questions. This is a book that is sure to spark bookish chat aplenty, so smuggle in your best book group snacks and wear your comfiest (pirate-themed) PJs!